Situated south of Munich with views of the Schäftlarn monastery and Isar valley, Klosterbräu Schäftlarn is set in an idyllic Bavarian location. The beer garden has existed since early 1920th and has since remained a popular meeting place amongst people to meet up for a beer, especially during weekends. The beer was originally brewed and sold on location by the Schäftlarn monks, a tradition that ended when the monastery eventually stopped brewing beer in 1974. The beer garden has 500 seats, mostly wooden furniture. The self-serviced area is well-shaded by large chestnut trees. 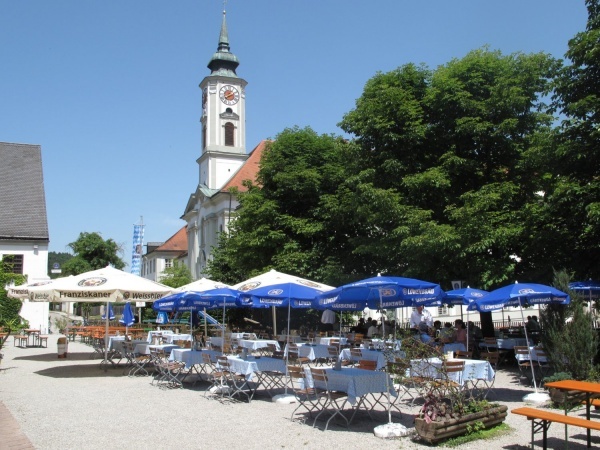 The food stalls offer Bavarian beer garden meals to the many by-passing cyclists and visitors. A monastery store across the road sell various hand-crafted items made by the monks and nuns. The restaurant serves ecologically farmed beef from Angus cattle. If ordered in advance, fresh beef is also for sale in five or ten kilo packages at about €16 per kilo. On Sundays farmers duck is a special item on the menu. A guesthouse with 10 rooms is part of Klosterbräu Schäftlarn. This beer garden is open daily from 10am to at least 10pm. During weekdays visitors of the self service area are expected to fetch their beer themselves from inside the restaurant, which should not be a problem given the fact that a Maß Löwenbräu at this beer garden costs only €6.50 (August 2016).